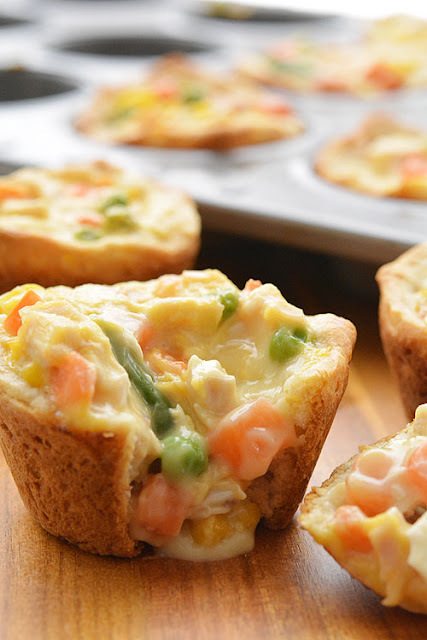 These mini chicken pot pies are ridiculously easy. Seriously… they only have 4 ingredients! And you can make them from start to finish in about 30 minutes. Serve them with a little side salad and it makes a quick and simple weeknight dinner! But then a funny thing happened. I had my three kids, and I realized that being a parent is about a million times harder than I ever thought it would be. When everyone gets home from school and daycare at the end of the day, things are kind of like a zoo around here! So when I find a simple, kid friendly recipe, I’m totally on board with it! Using your fingers, push down on the dough starting in the middle, then working the dough up the sides of each of the muffin compartments, as high as it will go. Add the filling to each of the compartments (approximately 2 Tablespoons each). Bake at 375F for 20 to 25 minutes until golden brown and bubbly. 0 Response to "Mini Chicken Pot Pies"